How can I learn about my risk of getting an infection? How can I reduce my risk for infection? What is a low white blood cell count? How does the body normally resist infections? Who is at risk for getting an infection? What should you do if you think you have an infection? Are there certain foods that can cause an infection? 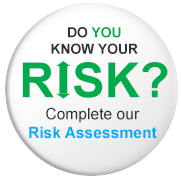 Complete the risk assessment tool to learn about your risk for developing a low white blood cell count during cancer treatment. Hand washing is the number one way to prevent infections. This should include you, all members of your household, your doctors, nurses and anyone that comes around you. Don’t be afraid to ask people to wash their hands. Washing your hands with soap and water is the most effective, but it's OK to use an alcohol-based hand sanitizer if soap and water are not available. Before and after treating a cut or wound or caring for your catheter, port, or other access device. Chemotherapy is a commonly used treatment for cancer. These powerful cancer-fighting drugs work by killing the fastest-growing cells in the body—both good and bad. This means that along with killing cancer cells, your healthy white blood cells, called neutrophils, are killed too. When the number of neutrophils is reduced, a condition called neutropenia occurs and your risk of getting an infection is increased. The period of time beginning 7 – 12 days after you finish each chemotherapy dose—and possibly lasting for 5-7 days—is when you have the fewest white blood cells in your body. Because of this, it will be extra hard for your body to fight off germs during this time. This period of time is often called your nadir, meaning “lowest point.” This is when you are more likely to develop neutropenia. This period varies slightly depending upon the chemotherapy drug, or combination of drugs, used. Your doctor and/or nurse will let you know exactly when your white blood cell count is likely to be at its lowest. You should watch very carefully for signs and symptoms of infection during this time. During these high-risk days, you should take your temperature any time you feel warm, flushed, chilled, or not well. Your immune system helps your body protect itself from getting an infection from germs. Cancer and chemotherapy can damage this system, reducing your numbers of infection fighting white blood cells and making it harder for your body to fight infection from germs. You have another condition that makes it more difficult to fight off infections (i.e., diabetes, kidney disease, high-blood pressure, congestive heart failure, an auto–immune disease, liver dysfunction, chronic bronchitis, or emphysema). You have a type of cancer that affects the blood or lymph nodes (for example, leukemia). The chemotherapy that you are receiving is strong. You are receiving more than one chemotherapy drug. The stronger the chemotherapy, the more of your white blood cells will be killed, making your immune system weaker. Strong chemotherapy may also make your immune system weaker for longer, which also increases your risk of getting an infection. Your doctor or nurse has told you have a low white blood cell count in the past. To find out more about the risks of developing a low white blood cell count from your chemotherapy, speak with your doctor or nurse. Many times, fever may be our body’s only sign of an infection. Infections during chemotherapy can be life threatening and may delay future treatments. Because your white blood cell count is low, your body may not be able to fight the infection on its own. This is why it’s very important that you call your doctor immediately, even if it is in the middle of the night, if you have a temperature of 100.4ºF (38ºC) or higher. Keep a working thermometer in a convenient location and know how to use it. Take your temperature any time you feel warm, flushed, chilled, or not well. Keep your doctor's phone numbers with you at all times. Make sure you know what number to call during their office hours and what number to call after hours. If you have an emergency during a time when the office is closed, DO NOT wait until the office reopens before you call. 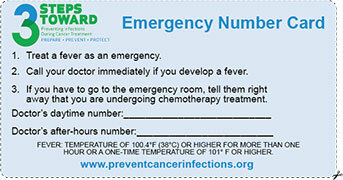 If you have to go to the emergency room, it’s important that you tell the person checking you in that you are a cancer patient undergoing chemotherapy. This is because if you have an infection, you shouldn’t sit in the waiting room for a long time. Infections can get very serious the longer they go untreated. If you are embarassed, you can show this card. If you experience any of these signs or symptoms you should call your doctor immediately. Contact your doctor immediately, even if it is the middle of the night. Do not wait until the next morning. Keep your doctor’s phone numbers with you at all times. Make sure you know what number to call during your doctor’s office hours, as well as after hours. There are things that you need to be aware of when choosing the types of food you plan to eat. Remember that your cancer, or the medicine that you are taking to treat your cancer, may increase your risk of infection. Undercooked or raw meat or eggs. Raw or unpasteurized products (check the label on the dairy products you buy such as milk and cheese, and fruit juices, to ensure they are pasteurized). Raw and unpasteurized products contain bacteria that may cause you to become ill.